We can quote crane kits up to 100-Tons. These bridge crane kits by Yale | Lift-Tech, Harrington, and R&M contain all the parts needed to build underhung and top running single girder bridge crane bridges, except for the hoist, bridge beam, and trolley stop angles. 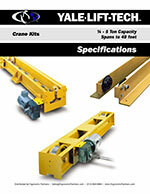 Our Yale | Lift-Tech kits are for single girder cranes with spans to 48 feet and capacities up to 5-ton. These bridge kits are available in a wide variety to meet the exact requirements of your crane application. End trucks carry the hoist and bridge of the crane up and down the cranes' runway. R&M end trucks are available in a variety of top and under running designs and are specifically designed to suit your crane's application. Harrington's TM motorized, TP push, TG geared, UM motorized, UP push and UG geared end trucks offer the benefit of space saving designs and are recommended for heavy-duty, class "C" crane applications. 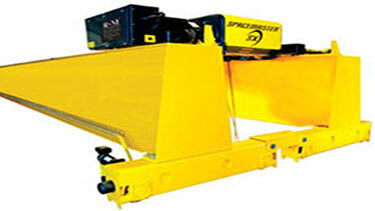 Under-Running Angle Type End Trucks: Capacities: 1/2 through 2 ton, Span: Up to 30 feet. Crane end trucks are constructed out of heavy steel angles with pressed steel or forged wheels. 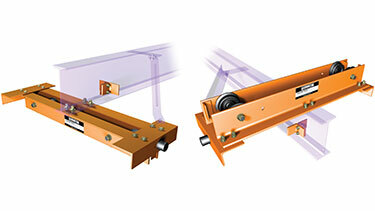 Bridge crane kit comes with bolted steel safety lugs and hardware to attach to the bridge beam. This economical crane kit can be provided with patented track wheels, or spark resistant wheels. Under-Running Channel Type End Truck: Capacities: 3 or 5 ton, Spans: Up to 36 feet. Kit comes with bolted steel safety lugs and hardware to attach to the bridge beam. 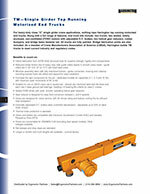 This heavier channel bridge crane kit can be provided with patented track wheels, or spark resistant wheels. Top Running Push Type End Trucks: Capacity: 5 ton, Spans: Up to 36 feet. 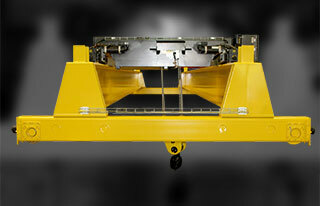 Double flange wheel designed for up to 40# ASCE rail. The end truck is designed from channels to for a rigid box. All bearing all lifetime sealed. Bronze wheels are available for a spark resistant crane. 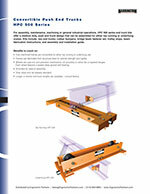 CHPC Convertible Single Girder Crane Kit: Capacities: 1/2 through 2 ton. No welding is required with an easy bolt together assembly. Rail sweeps and drop stops are standard equipment. Cranes include a pre-drilled bridge beam, end trucks, all necessary hardware. This push type crane is rated for Class "B" medium duty use. This system is suitable for top running or underhung applications. This bridge crane kit does not include a hoist. UM/UP/UG Underhung and TM/TP/TG Top Running Harrington End Trucks: These single girder end trucks come in capacities from 1 Ton to 10 ton and can be motorized or manual push/pull. They are designed with side guide roller assemblies to reduce wear and tear on beam flanges. All components meet CMAA requirements and are manufactured out of high quality tube steel. 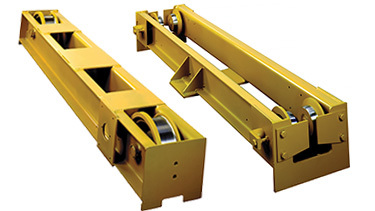 Heavy duty box construction | Double flanged wheels | Include rail sweeps and bumpers. Standard wheels are flat tread ductile iron | Rotating axle drive wheel (optional on idler wheel). Mates with GES Series Bridge Drives | Bolted structural connection plates. Single girder, double girder and bogie trucks available. Adjustable for various flange widths | Mates with R&M GEK Bridge Drives. Ductile iron, single flange crown tread wheels | Easy access to wheels for maintenance. Patented track wheels available | Lubricated for life anti-friction bearings | Equipped with bumpers and drop lugs. 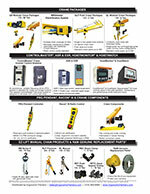 Ergonomic Partners can provide additional crane accessories. If you would prefer for Ergonomic Partners to provide a complete crane we can come to your facility to specify and provide a solution to your crane needs. Complete cranes provided up to 120 foot span and 100 ton capacity. C-Track bridge / Tagline bridge or runway festoon | Collector arms and collectors | Runway electrification | Manual or motorized hoist and trolleys | Top or under-running runways | Radio controls | Motorized crane components. Contact your Ergonomic Partners sales representative for a site visit. Ergonomic Partners manufactures, sells, and services bridge crane kits and end trucks; serving clients from coast to coast, Canada, Mexico and especially focused in the states of Missouri, Illinois, Indiana, Kansas, Arkansas, Mississippi, Nebraska, Tennessee, Kentucky, Iowa, and Oklahoma.